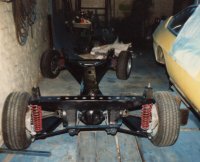 At some point a previous owner had modified the car - obviously the whole thing had been apart and benefitted from a chassis re-spray. As the car I had bought had been lying doing nothing for well over a year, some of this work had been undone, but at least I knew that the car was basically sound - the most important thing, I felt. A Lotus contact told me of a very effective (and extremely messy) way of rust proofing which I have included in the technical help secion. After all, look at the picture above. You have a car that is designed to float round the most evil of corners and whose engine is designed to be most effective at high revs (the torque curve between 4 500 r.p.m. and 6 500 r.p.m. is flat !) If all you have between you and the outside world are 3 bits of angle iron, you don't really want them to be corroding ! !